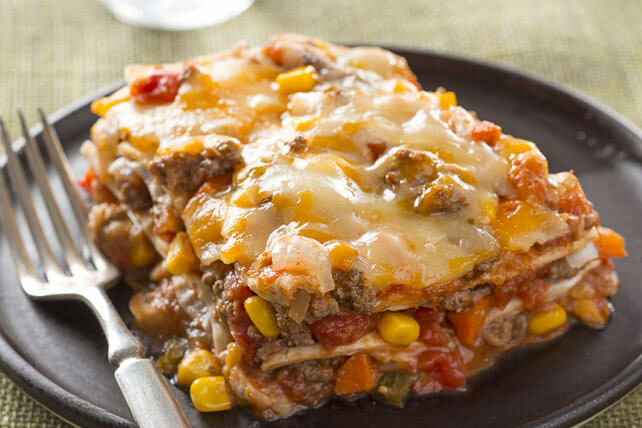 With layers of seasoned ground beef, melted cheese and warm tortillas, this burrito casserole will be the talk of the table. It’s a simple take on classic burritos - just layer, bake and enjoy! Brown meat with peppers, carrots, onions and garlic in large nonstick skillet. Add next 4 ingredients; mix well. Cover; simmer 5 min. Remove from heat. Spread 2 cups tomato mixture onto bottom of 13x9-inch baking dish; top with 4 tortilla halves, with cut sides of tortillas facing sides of dish. Cover with layers of half the beans, 2-1/2 cups of the remaining tomato mixture and 1/2 cup cheese. Repeat layers. Top with remaining tortillas, tomato mixture and cheese; cover with sheet of foil sprayed with cooking spray. Bake 35 to 40 min. or until heated through, uncovering for the last 5 min. Let stand 5 min. before cutting to serve. Serve topped with shredded lettuce, thinly sliced radishes and sour cream just before serving. Cutting the tortillas in half gives you the straight edges needed to allow the tortillas to fit against the sides of the baking dish. Spoon the refried beans into microwaveable bowl; cover with paper towel. Microwave on HIGH 20 to 30 sec. or just until warmed. Store remaining taco seasoning mix in airtight container at room temperature up to 1 month before using as desired.